Invite your friends to Hitch and BOTH of you get a bonus! $200 from us to you for spreading the word! * We are making our referral bonus BIGGER and BETTER. After your friend completes ONE ride as a driver, we’ll credit $20* to both of your driver wallets! Refer 5 or more friends to sign up as Hitch Drivers and receive an additional $100! * – That’s $200 OR MORE just by telling 5 friends! Refer your friend in just ONE CLICK! You can now send your friends the referral invite in just one click! Remember to follow up with your friends to make sure they have successfully signed up with YOUR referral code or Phone Number and encourage them to do 1 Hitch Ride before 30 June 2017 to qualify for our DRD bonuses! Don’t have the time to help your friend? Is your friend asking too many questions about GrabHitch? We are here to help! Send this link: grb.to/newtohitch to your friend! We have a step-by-step instruction guide on signing up, and basic information about GrabHitch to help our new Hitch Driver in the sign up process. For enquiries on our DRD scheme, or if you have additional feedback on GrabHitch, please email us at : grabhitch@grab.com with the Subject: GrabHitch DRD and we will get back to you in 1-3 working days. Please click here for more information about our May DRD. The $20 credit for referrer / $20 credit for referred scheme runs from 1st June 2017 @ 00:00 hours – 30th June 2017 @ 12:00 hours. For our Hitch drivers who are also passengers – this Driver Refer Driver Scheme takes precedence over the Passenger Refer Driver Scheme, so your referral will be logged as a Driver referral instead of Passenger referral. Only referrals who sign up with YOUR Grab-registered mobile number (include 65 in front e.g. 6512345678) OR the driver’s unique referral code will be counted as a valid referral. 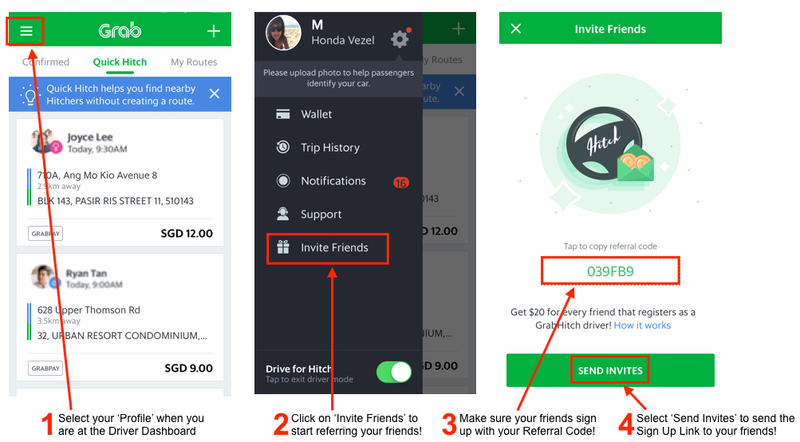 You will only receive $20 credit in your GrabHitch driver wallet after your friend has successfully completed ONE GrabHitch ride as a driver before the incentive period has ended. Each driver will only be entitled to an additional $100 credit into their driver wallet for 5 OR MORE successful referrals. After your friend has completed his/her ride as a driver, please allow up to 10 working days after the incentive period has ended (i.e. post-30th June 2017) for your own credits (including any additional bonus if eligible) to be processed into your GrabHitch driver wallet. You have to apply with a valid Hitch driver’s mobile number (65 plus his/her 8-digit mobile number) OR the driver’s unique referral code and do ONE successful GrabHitch ride as a driver by 30th June 2017 12:00 hours to count as a successful referral for your friend. After completing your ONE GrabHitch ride within the incentive period, please allow up to 10 working days after the incentive period has ended (i.e. post-30th June 2017) for the $20 credit to be processed and transferred into your GrabHitch driver wallet.